Whether your child is a tumbling expert by now or they’ve never attempted a forward roll, MGA Cheer Extreme is here to help. Many parents aren’t sure how tumbling progression works when they first enroll their child in tumbling classes. How long should it take for their athlete to learn a back handspring? When will they be ready to move up to another level? 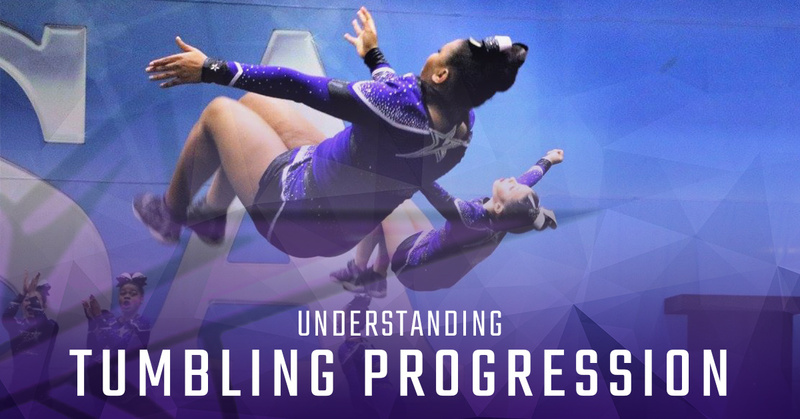 We are here to answer some of the most commonly asked questions about tumbling progression. How do you determine an athlete’s ability to move up a class? First and foremost, we believe in keeping our athletes safe. Just because an athlete can throw a skill does not mean they have the proper technique and necessary knowledge to land safely. Our coaches determine where an athlete is in their progression, then they work closely with the athlete to address any concerns. Let’s say your kiddo keeps bending her knees in her back walkover. We are going to work with her until we are confident in both the technique and stability of her tumbling before we advance her to a harder class. This will allow her to learn new things safely and with confidence. How long does it take to learn a new skill? This depends on the athlete. For some, they can master just about every tumbling skill there is by the age of 14. Other athletes will need a year or so to learn just one thing. No matter what pace your athlete learns at, we want you to know that they are being trained safely. Many skills require strength, flexibility, and body control. Our staff works to ensure that all three of these skills are being met before the athlete is ready to perform the tumbling on their own. We know how frustrating it can be to work on the same skill for weeks — or even months — on end, but we know that your athlete will succeed and be able to learn new skills in no time. Stay optimistic and encouraging; you’ll be amazed at what your child can do! How do I know what class my child should be in? We can help with that! Our classes are divided up by skill level to ensure each athlete receives instruction that is both accessible and understandable, no matter what class they are in. We will perform a basic tumbling assessment of your athlete to see what they have mastered and what they still need to learn. From there, we can recommend a good starting class. Don’t worry if your child has never tumbled before! Everyone starts somewhere. It would be our pleasure to introduce your child to the exciting world of tumbling. If you would like to learn more about our tumbling classes, we highly encourage you to stop into one of our facilities with your athlete. We’d be happy to give you a tour of the facility and allow you to take a peek into what tumbling classes at MGA Cheer Extreme are really like. Reach out now to learn more about our schedule or to choose a convenient time to stop by. We’ll see you soon!